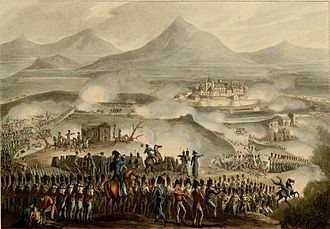 The Battle of Scapezzano was a short engagement in the Neapolitan War on 1 May 1815 between an Austrian corps under Adam Albert von Neipperg and Neapolitan division under Michele Carrascosa. 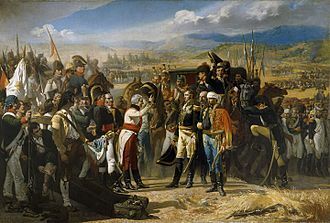 By May 1815, the war had turned against the Neapolitans and Murat had been driven back to his original headquarters in Ancona. However, the two pursuing Austrian corps under the command of Neipperg and Bianchi had become separated by the Apennine Mountains. 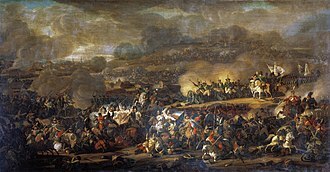 Neipperg's force of 15,300 had directly followed the retreating Neapolitans along the Adriatic coast, whilst Bianchi's force of 12,000 had marched on Foligno, in the centre of Italy, to cut off the line of retreat back to Naples. 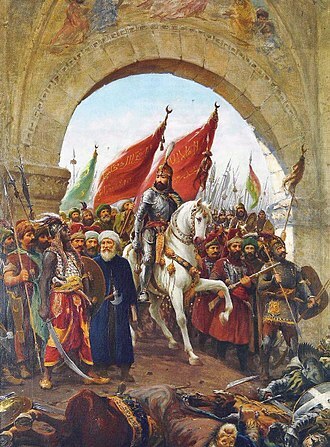 Murat, who now had over 30,000 men in Ancona, hoped to turn and defeat one Austrian corps before the two forces could join together. 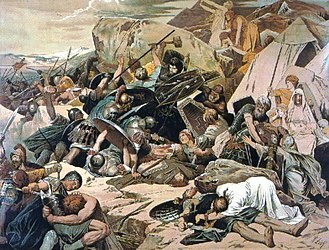 Murat decided to send his main force against Bianchi and chose an area around Tolentino, west of Ancona to give battle. 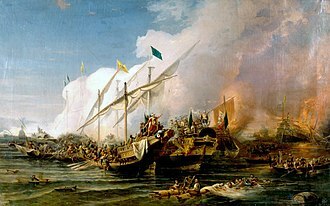 He dispatched a division under Carascosa north along the Adriatic coast to hold Neipperg until Bianchi had been defeated. 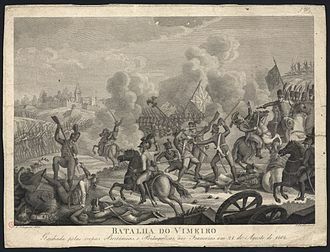 However, following intense manoeuvring and a few small skirmishes, the Neapolitans were in danger of becoming surrounded and retreated in an orderly fashion. 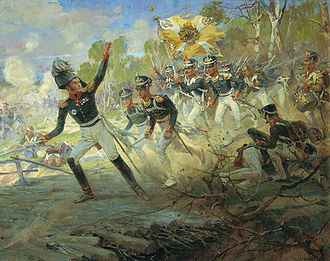 This allowed Neipperg to threaten the main Neapolitan force under Joachim Murat engaged at the Battle of Tolentino. 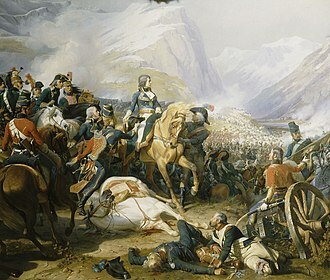 This engagement eventually resulted in a decisive victory for the Austrians, and the war soon ended with the Treaty of Casalanza on 20 May. The Confederation of the Rhine was a confederation of client states of the First French Empire. 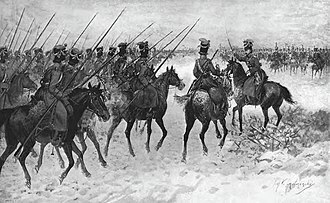 It was formed initially from 16 German states by Napoleon after he defeated Austria and Russia in the Battle of Austerlitz, the Treaty of Pressburg, in effect, led to the creation of the Confederation of the Rhine. 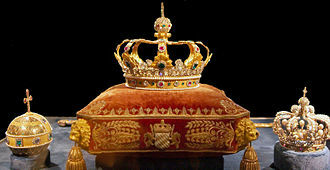 It lasted from 1806 to 1813, the members of the confederation were German princes from the Holy Roman Empire. They were joined by 19 others, all together ruling a total of over 15 million subjects providing a significant strategic advantage to the French Empire on its eastern front and Austria were not members. 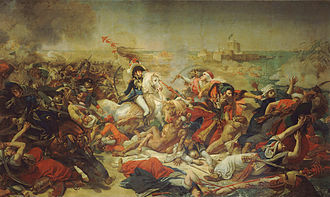 Napoleon sought to consolidate the modernizing achievements of the revolution, but he wanted the soldiers, Napoleon required it to supply 63,000 troops to his army. 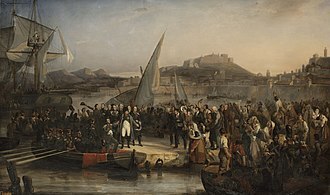 The success of the Confederation depended on Napoleons success in battle, on 12 July 1806, on signing the Treaty of the Confederation of the Rhine in Paris,16 states in present-day Germany joined together in a confederation. 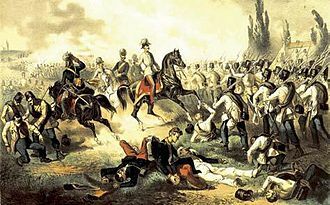 On 1 August, the members of the confederation formally seceded from the Holy Roman Empire and his Habsburg dynasty continued as emperors of Austria. 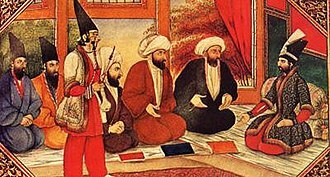 According to the treaty, the confederation was to be run by common constitutional bodies, as such, he was President of the College of Kings and presided over the Diet of the Confederation, designed to be a parliament-like body although it never actually assembled. 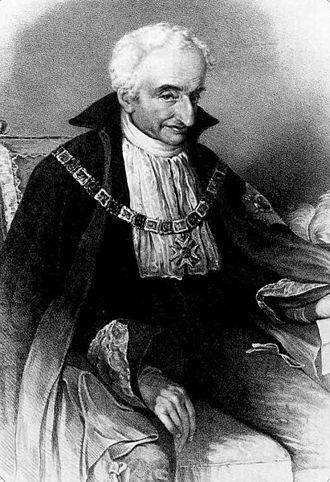 The President of the Council of the Princes was the Prince of Nassau-Usingen, in return for their support of Napoleon, some rulers were given higher statuses, Hesse and Berg were made into grand duchies, and Württemberg and Bavaria became kingdoms. States were made larger by incorporating the many smaller Kleinstaaten and they had to pay a very high price for their new status, however. 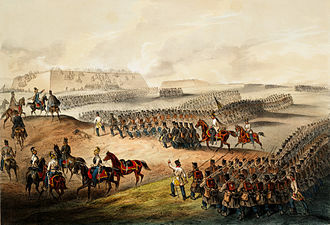 The Confederation was above all a military alliance, the members had to maintain substantial armies for mutual defense, as events played out the members of the confederation found themselves more subordinated to Napoleon than they had been to the Habsburgs. 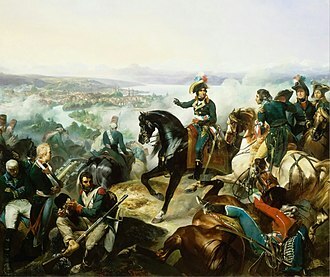 After Prussia lost to France in 1806, Napoleon cajoled most of the states of Germany into the Confederation of the Rhine. 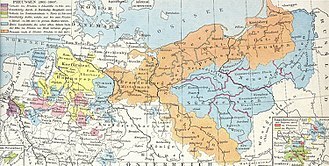 Eventually, an additional 23 German states joined the Confederation and it was at its largest in 1808, when it included 36 states—four kingdoms, five grand duchies,13 duchies, seventeen principalities, and the Free Hansa towns of Hamburg, Lübeck, and Bremen. 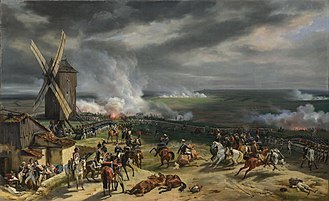 Only Austria, Danish Holstein, and Swedish Pomerania stayed outside, not counting the west bank of the Rhine and the Principality of Erfurt, which were annexed by the French empire. In 1810 large parts of what is now northwest Germany were quickly annexed to France in order to monitor the trade embargo with Great Britain. 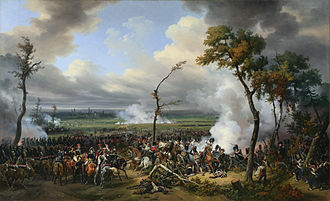 The Confederation of the Rhine collapsed in 1813, in the aftermath of Napoleons failed campaign against the Russian Empire, many of its members changed sides after the Battle of Leipzig, when it became apparent Napoleon would lose the War of the Sixth Coalition. The following table shows the members of the confederation, with their date of joining, the allies opposing Napoleon dissolved the Confederation of the Rhine on 4 November 1813. The Kingdom of Etruria was a kingdom between 1801 and 1807 which made up a large part of modern Tuscany. 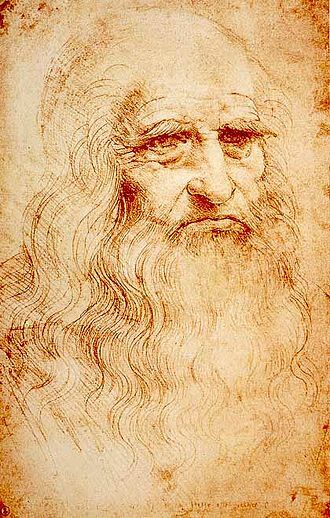 It took its name from Etruria, the old Roman name for the land of the Etruscans, the kingdom was created by the Treaty of Aranjuez, signed at Aranjuez, Spain on 21 March 1801. 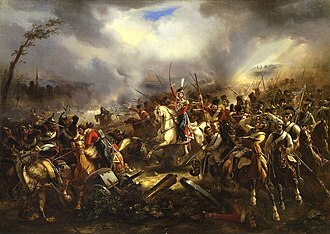 In the context of an agreement between Napoleonic France and Spain, the Bourbons of Parma were compensated for the loss of their territory in northern Italy. 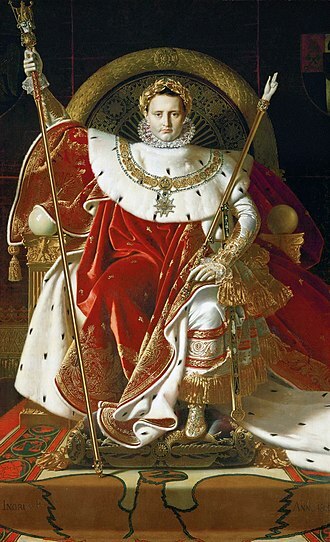 Ferdinand, Duke of Parma ceded his duchy to France, to make way for the Bourbons, the Habsburg Grand Duke of Tuscany Ferdinand III was ousted and compensated with the Electorate of Salzburg. 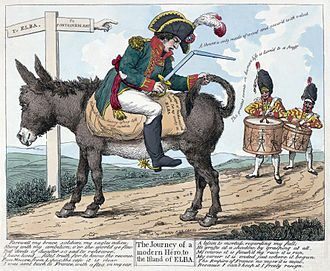 Originally the Duchy of Tuscany, Etruria had been ceded to the Bourbons in 1801 in the person of Charles IVs eldest daughter and her Italian consort, Louisiana was duly transferred to France on 15 October 1802, after the signing of the Treaty of Aranjuez. 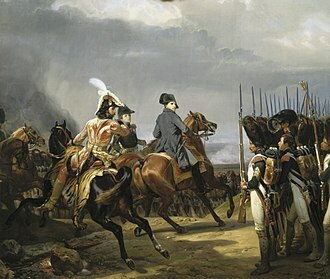 Napoleon subsequently sold Louisiana in the Louisiana Purchase on December 20,1803, the first king died young in 1803, and his underage son Charles Louis succeeded him. The Duomo (Cathedral) of San Feliciano in Foligno. First edition of the Divine Comedy, printed in Foligno in 1472. Top left: Annonario Square, Top centre: Rocca Roveresca Fortress. Top right: Night view of Piazzale della Libertà waterfront area, Middle left: Chiostro delle Grazie. Middle right: Rotonda a Mare. Bottom left: View of the sunset in Spiaggia Velluto Beach. Bottom centre: View of the town from Scapezzano Hill. 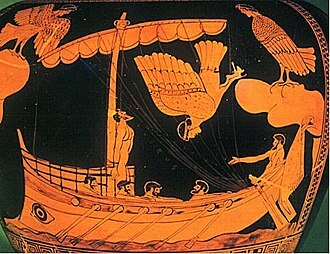 Bottom right: Portici Ercolani. The Chiostro delle Grazie ("Cloister of the Graces").